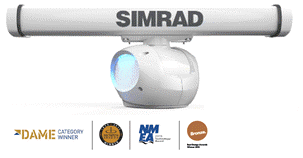 Simrad Halo Radar is the world’s first high performance, solid-state radar with pulse compression technology designed specifically for light commercial and recreational marine use.Unlike traditional pulse radar, Halo Radar isn’t reliant on a high-powered magnetron (vacuum tube) to transmit. Instead, Halo Radar uses solid-state electronics and low-power 25W pulsed, frequency-swept transmission bursts to deliver pulse radar-like range and resolution, without the associated warm-up time, power consumption, or electromagnetic emissions. Separating one radar target from another is key. Beam sharpening provides the Halo Radar with exceptional Target Separation Control for discriminating between radar targets, granting the Halo Pulse Compression Radar’s 3-foot open array antenna the same effective target resolution as an 4-foot array without beam sharpening. With Dual Range, Halo Radar functions like two arrays in one – monitor two distance ranges simultaneously with independent displays, controls, and totally independent MARPA target tracking. Take full advantage of Halo Radar’s combination of short-, mid-, and long-range performance to keep an eye on faraway weather cells, while monitoring channel markers and high speed watercraft up close. Dual Range operation is available with Simrad NSS and NSO multifunction display systems. Halo Pulse Compression Radar provides rapid position updates, with high speed operation up to 48RPM (mode and range dependent). Simrad quality construction and Halo Radar's brushless motor with advanced helical gear train design ensure exceptionally quiet operation, especially at 48RPM. Collision hazards won’t wait for your radar to start up – why should you? Halo Radar’s solid-state technology is ready instantly from standby, and in just 16-25 seconds from power-on to fully-operational. Avoid the 2-3 minute warm-up time associated with traditional pulse radar, and trust Halo Radar to produce an immediate, accurate radar image when you need it. Halo Radar uses 40W average with no wind, and no more than 200W at maximum wind velocity. Experience even greater power savings in standby with just 7W power usage, versus 10/15W for pulse radar. With its low power consumption and support for 12/24 volt DC systems, Halo Radar is ideal for small to mid-sized powerboats. Description 25 W Halo® Pulse Compression Radar System. System consists of radar pedestal, antenna, 20 m (65 ft)Interconnection cable and RI-12 Interface Module.